Can I just say….WOW! Look what I just got for 50 smackeroos! This cabinet! Take a moment and adore it with me. Aaaahhh. Ohhhh. OK, that’s enough. Thanks! I was in our local small town, tiny thrift shop the other day and saw this baby. She was opened up with all kinds of misc. junk displayed all over the table top. Hard to even see it for all of the junk on it. But… then I stepped back and saw the details and was whooped. Price tag said $100, but everything in the store was 50% off that day. So, like a dummy, I left the store. Dum-mm-y. The whole drive home I thought that I should turn around and go get it, but I didn’t. Once at home, I agonized about driving back the 10 minutes to go get it until it was just too much to take. I grabbed my 14 year old, bribed her to go inside a thrift store with me and hustled back down there. …you use your knee instead of a foot petal. Really…how cool is that? 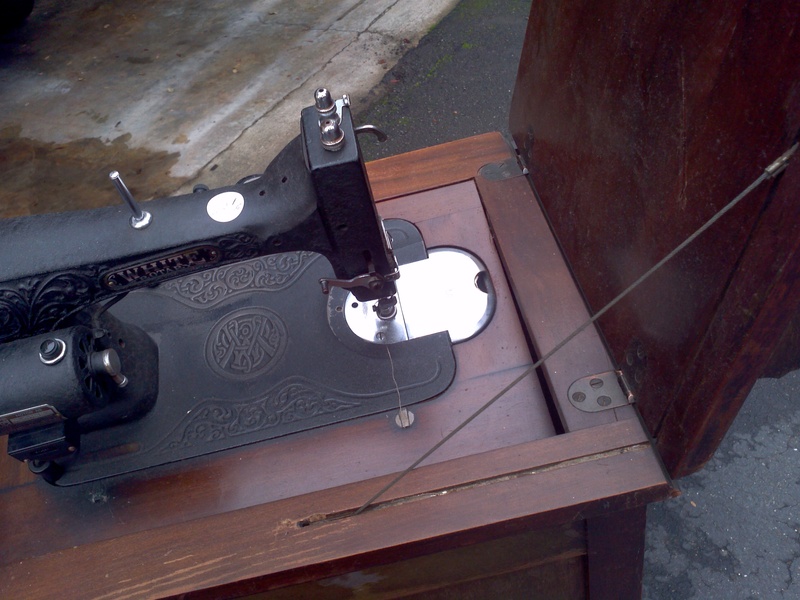 Want to see how easy it is to stow the sewing machine away? You just lift up and close the extended side table and it disappears into the cabinet. I really hope that this post doesn’t sound all braggy. I am just super excited and thought that I would share. See what I mean? Hard decision. So….what would YOU do? Leave it or paint it? 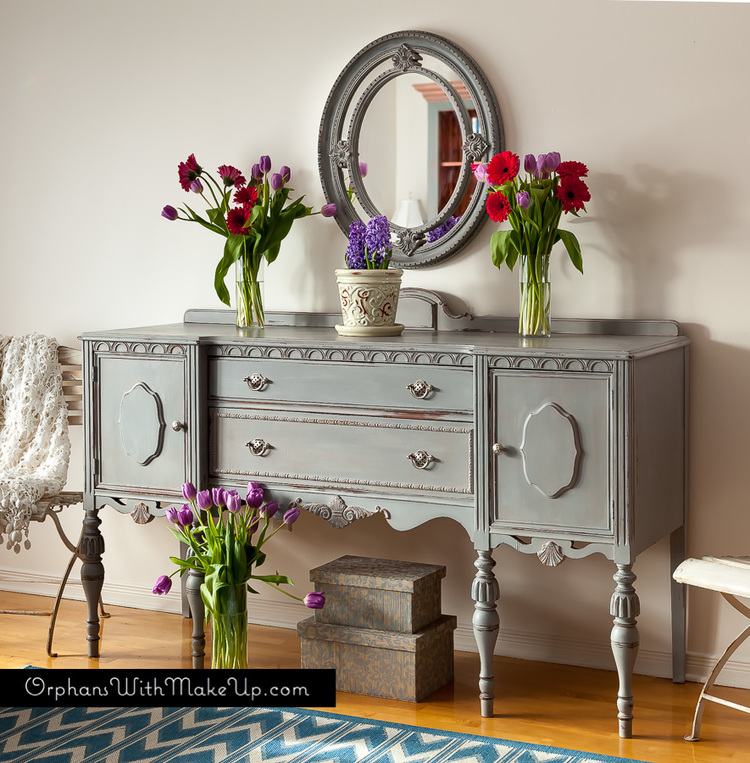 I spent a lot of time drooling over all of your awesome furniture makeovers on your blog. 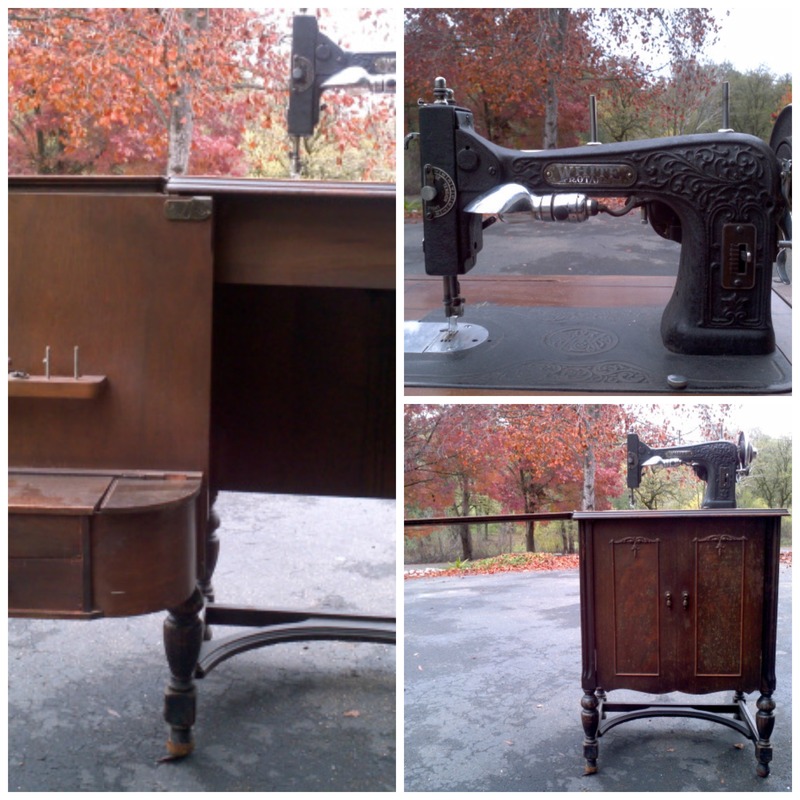 You have found and re-done so many amazing pieces! Thanks for letting me share one of them! PAINT IT!!!! 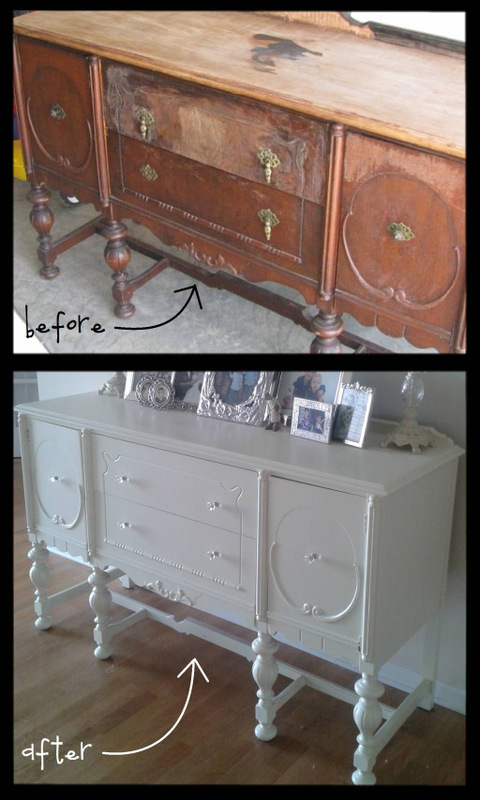 There is no place written in the bible that says “Thou shalt not paint antique furniture”. However, there are many places where there is reference made to words such as redeeming, and making white as snow. Which are good things. Personally, I think that painting brings out the lovely detail, especially if it is a light color. Love your blog! It’s like you are sitting right next to me…brightening my day, and encouraging me to be brave. I had a mantle installed, and I just painted it. Grey…for now. Maybe black later. Jeff is out of town, so I ordered shutters! We are buying our appliances this week! Our stove top will be induction! OOOoooo! scary sci-fi new! GE Profile Stainless steel! Keep blogging! I love it! You are so sweet! Have you gotten up the courage to paint your dining set? I know that it would be beautiful! You should google or do a Pinterest search for painted dining sets and see if anything tickles your fancy. It takes next to no time at all to sand down a table top with an orbital sander. 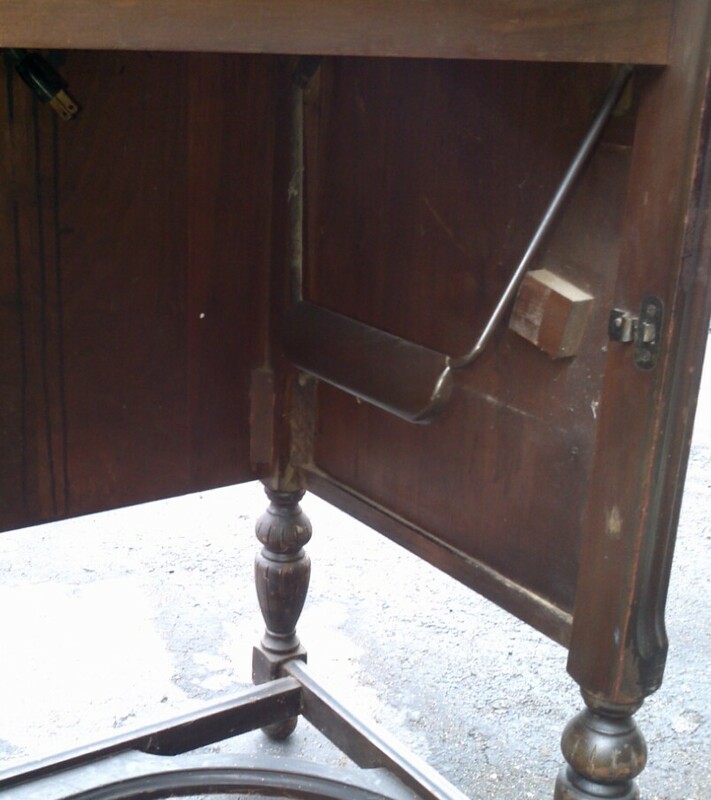 You could even stain the table and seat tops and paint the legs and chair backs. Spray paint goes on SO fast. Miss you! Did you paint it? Do you know what this is worth? Beautiful piece! I haven’t painted it…yet. Maybe ever. At the moment, I am liking the way it contrasts with the newly painted white walls in our guest room. I have no idea what the piece is worth. I have tried to Google it without any luck. Thanks for your comments! Personally, I would never paint mine. If you ever can find parts, I’d love to know where…..
How lucky for you! Your grandma had great taste! 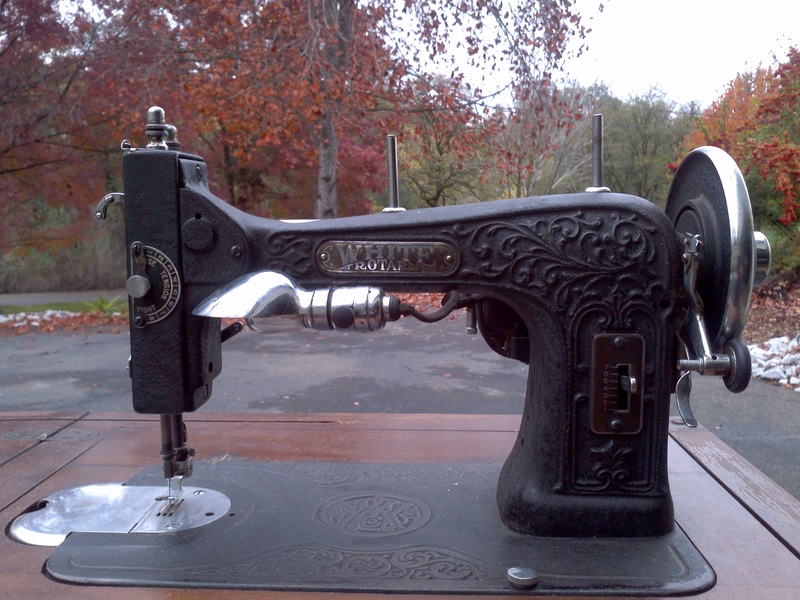 Mine doesn’t have a manual and, unfortunately, I haven’t been able to locate a date. Ditto for you, about the parts 🙂 . 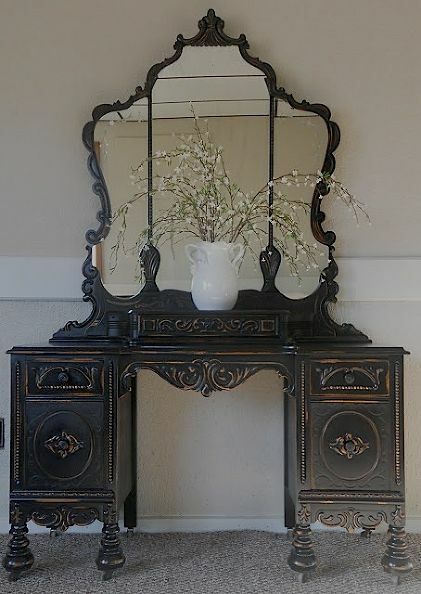 I found the same cabinet at a local estate sale…I would never paint any of the antiques I was handed down but this needed a little “pop” so I painted it matte black for the base and refinished the top. I love it! When you open it people gasp at how pretty it is. Post pictures when you do yours, I’d love to see it! I would love to see a pic! You can send it to spcountrygal@hotmail.com and I will post it here, with your permission, of course. My cabinet is currently in our guest room, unpainted, but for now I’m good with that. Thanks for checking out my little blog! Hi! 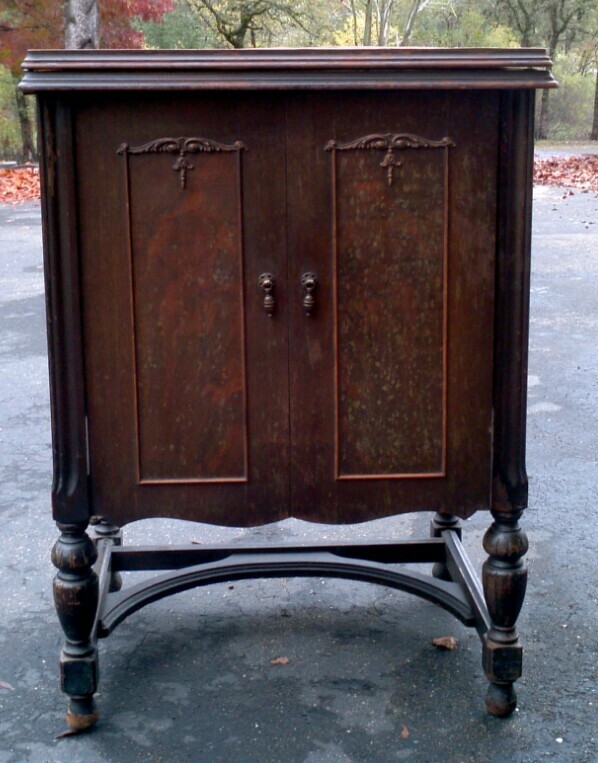 I bought the same cabinet at a veteran thrift store today, i paid $50 and would love to know more about the year it was made, and all the history of it , please share, i would definately sand and paint with a natural tone!!!!! Thanks for sharing!!!!! Congratulations on finding such a treasure for quite a bargain! 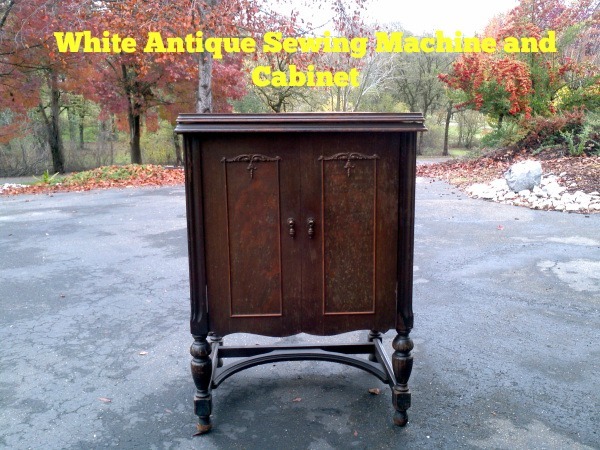 I have tried to find info about this machine/cabinet online, but so far, nothing. If I do end up finding something, I will be sure to let you know. Thanks for stopping by my little blog!